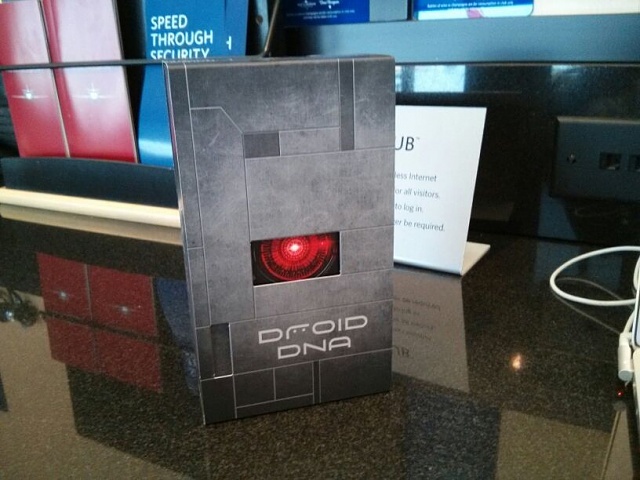 I have a DROID DNA. You have questions. Fire away! xXBLACKBERRYXx5 and MangoPowah like this. Lol. I believe probably so. Gonna need a *little* more time with it. Not awesome: Those same annoying DROOOOOOOOOOOID sounds. Can you see the battery tanking by the second? I think one of the biggest issues that need clearing right now is the battery. Please let us know how long it lasts you with some moderate use. Also, did you get that wireless charging thing? Otherwise, my only request would be some more detailed/high resolution photos, ideally with some flash at an angle to show off the curves. It looks chunkier than the J-Butterfly, but the photos have not been shot or touched up the same way. I'm ready to upgrade from my Thunderbolt. How much is the DNA off contract? I want to keep unlimited data. I like the DNA specs but I work 12 hours shifts & need a battery that lasts. Non removable battery & lack of expandable memory is a concern. But otherwise it looks really nice. Can you do an XDA unboxing? hossman12 and sropedia like this. I forgot to ask about sense. Is it really intrusive? This is coming from a gnex plain aosp user. 4.2 right? Oh and is the bootloader unlockable. The rezound bootloader was a fiasco. I like it. Love the soft touch. It's big, but maybe more tall that big, ya know? Definitely feels smaller than a Note 2. I don't mind Sense so much. "Intrusive" is pretty subjective. I can currently say this about the bootloader: You've seen "developer" versions of other Verizon phones this year, right? Gonna need more than 2 hours to answer any battery questions, folks. Charger, MicroUSB cable. SIM poker thing. As good as the HOX, if not better. The bump to Super LCD3 from 2 has to do with coating and viewing angles, I'm told. Is it true there is no SD card slot? I'm sure someone will get to it soon enough but I'd personally like to see pictures of size comparisons with other phones. Failing that, how's the volume of the the speaker? Does it have two notification lights? If so where are they placed? Can you talk more about the LCD3 display, how does.it compare to the AT&T GN2. What's the likelihood we will see.a AT&T variant for the Holidays. How well does it run? Snappy? Compared to gs3, one X, nexus 4? Hows the screen compared to the iPhone retina display? And is there a noticable difference between the Note 2 screen and the DNA screen? Will Google Wallet work or is it being blocked by Verizon? Also, does FoxFi work? As I recall some HTC devices only work with Bluetooth on FoxFi. You have questions. I have a Droid RAZR. Ask away. I've got an HTC One X, you have questions ... FIRE AWAY! Droid X - And have you discovered - DLNA? - Share your stuff man!! Got my HTC Evo yesterday ask if you have any questions!